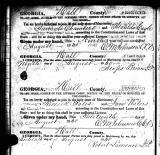 Ancestry.com transcription of Rice's marriage record record has thewrong date. The transcription reports the date of the certificate andceremony as 19 August 1840, but on the certificate record it is 13August 1840. The date is written out in longhand so cnanot bemistaken. Rice's widowed father, General John Bates, is living next door to him. In his household are two daughters, Nancy 30 and Frances 40, bothunmarried, as far as I can tell. Several Bates genealogies present the configuration of this family.